You have just got to love timeless jewelry creations and this necklace fits that description! It has every look of the classic designs that outlasts changes in fashion. Sharply attractive with its amethyst gemstone, diamond halo and sterling silver frame, this necklace is simply stunning. The necklace is fashioned from 925 sterling silver with exquisite and intricately linked chains. 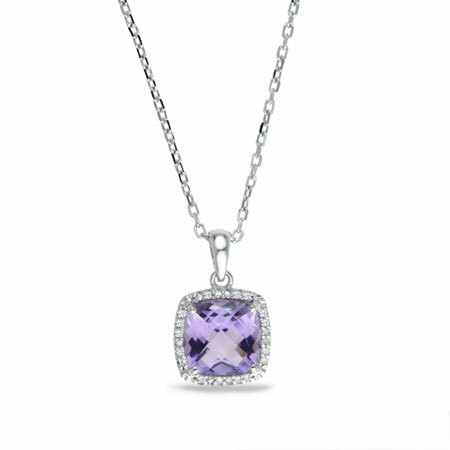 Suspended on the necklace is a pendant also fashioned from sterling silver and clasped onto it is the 2.08 Carat, cushion-cut, amethyst gemstone. Around the 8mm x 8mm frame of the purple gemstone and completing its halo effect, are twenty-four, 0.07 Carat diamonds. This necklace will grace any lady's neck with sublime grace and dignity. We guarantee our 2 Carat Cushion Cut Amethyst and Diamond Halo Necklace in Sterling Silver to be high quality, authentic jewelry, as described above.